Subscribe To Christian Education Informer Today! The Christian Education Informer: A Journal of Christian Education, is the official publication of the Division of Christian Education of the Sunday School Publishing Board, NBC, USA, Inc. The quarterly magazine is designed to keep our constituency abreast of the activities of our affiliated members at the district, state, and regional levels of our Convention. The Informer presents topics related to “Church and Society” and “Religion and Life.” Information articulated in the Informer is especially significant in light of the ongoing issues that present enormous challenges to the faith community in general and individual Christians in particular. 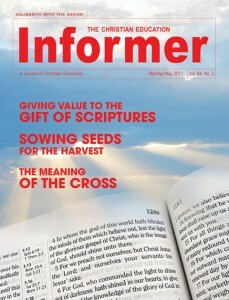 The Informer, provides a journal of the work of Christian educators and organizations throughout the Convention. It provides information about the basic program, ensuring that all readers are consistently updated on the latest programs and procedures of the Convention’s Christian education work. In addition to providing information about the workings of the Convention’s Christian education ministry, writers are invited to write timely articles that will benefit the readers of the magazine. These articles may be human interest stories, reports of major programs, or scholarly documents designed to update the reader on the best practices, the latest thinking, or scholarly theological insight into standard or controversial issues. The Informer, required reading for all instructors and deans in the Christian Leadership Schools program, is also a valuable resource for pastors, laymen, and educational leaders on all levels of Christian ministry. The journal is published four times a year—edited and published in the Publishing Division of the Sunday School Publishing Board. This educational journal, modestly priced, is a “must-read” for all persons who are interested in the ministry of Christian education. The staff of the INFORMER desires to know of activities connected with Christian Leadership Schools, District Associations, and Conventions to share with our many readers/subscribers. All compositions are to be submitted electronically via email attachment. Articles should be typed in MS-Word. Times Roman font preferred, 12 pt. size. Clear photographs (electronic) are welcome. Articles should be emailed to the Office of Christian Education three months prior to the desired publication date. Scholarly compositions on religion, Christian education, and theological subjects are welcome; the publication thereof will be exclusively at the discretion of the publisher. The Publishing will provide compensation as deemed appropriate for acceptable materials.